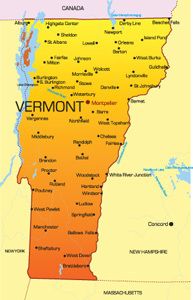 Vermont is the only New England state not bordered by the Atlantic Ocean. It is home to over 600,000 people and is known as the Green Mountain State. The bordering states are New Hampshire, New York and Massachusetts. The capital city is Montpelier but the largest city is Burlington, which has a population of 42,000 people. The major highways servicing the state are I-89, I-91, and I-93. Air travel is facilitated through airports like the Burlington National Airport. Notable universities in Vermont are Burlington College and The University of Vermont.